Those who know the Church Square shopping precinct centre off Church Street in New Lenton, will know the shop opposite the Coop Supermarket. 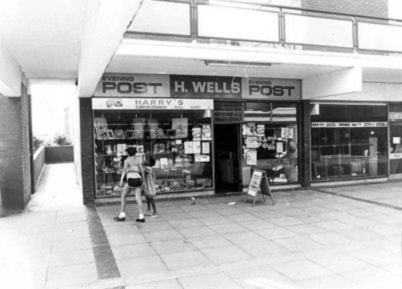 The signboard refers to Harry Wells Newsagent. From this July, however the sign has not told the truth. 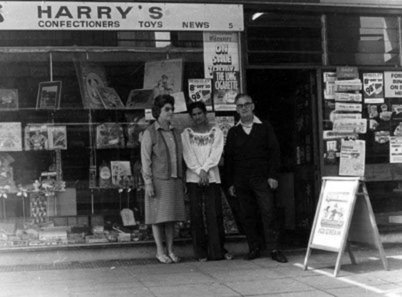 Harry and his wife Gladys have sold the business to Chitranjan S. Gill and his wife Seetal K. Gill. After almost forty years in business in the area we thought the Wells' departure should not go unmentioned. Harry Wells' long association with the area began in 1934 with his first job. The Co-op employed him to deliver bread in Lenton and Dunkirk. His means of conveyance was the customary horse and cart, but life was made more comfortable when he was given one of the first Co-op carts to be fitted with pneumatic tyres. After three years he forsook Lenton and took a job in the despatch department of Cheshire's of Nottingham, a wholesale furniture business based on Handel Street, Sneinton. Called up the day before war was declared, Harry served with the South Notts Hussars out in Palestine, Libya and the Western Desert. In 1942 he was captured by the Italians and spent the next three years in a variety of prisoner of war camps. On his release he returned to Nottingham and started looking for a small business in which he could invest his war gratuities. Willoughby Street, before its redevelopment in the 196Oï¿½s, ran right through from Castle Boulevard to Derby Road. It was Lenton's main shopping street with a multitude of different shops on either side of the road. Mrs. Kirkham's newspaper shop at the Castle Boulevard end of the street was up for sale and Harry liked the look of it. So in September 1945, in partnership with Ted Stafford, a friend from his army days, he set the seal on his future working life and took the shop. Theirs was not the only newsagency on the street. Billy Hill had one at the Derby Road end and in between were shops belonging to Joe Mason and Tom Elliot. 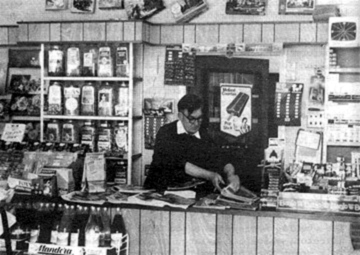 Billy Broughton initially ran a newsagency from his home on Lombard Street, but he subsequently opened a shop on Willoughby Street. (Billy was of diminutive stature and was commonly referred to as 'Tich'. He was a familiar sight in the area as he delivered his papers on a 'fairy' cycle - no bigger than the modern chopper). So the residents of the Willoughby Street area were quite spoilt for choice. In addition to purchases by the local populace, however, shopkeepers on Willoughby Street could expect quite a lot of passing trade. Instead of travelling into the City along Castle Boulevard, many of those from the Beeston area preferred to go along Willoughby Street and enter the City via Derby Road. Harry's newsagency at 163/5 was well placed to take advantage of this extra trade. As the morning and evening editions of the local papers rolled off the presses before the war, there would be a band of street runners ready who, loaded down with as many copies as they could carry, ran from the newspaper offices out into the suburbs, delivering the latest news as they went. Each had their own route that might stretch for several miles. With the coming of war, most of these men were called up and there was no one to take their places. Consequently they sold their delivery rounds to local newsagents. Mrs Kirkham had purchased one of these and Harry and his partner took this on when they bought the business. This round still exists and people as far out as Dunkirk receive their papers via Harry or one of his paperboys. One other unusual arrangement Harry and his partner inherited was a lending library. Mrs. Kirkham had built up a collection of about two thousand hard backed books in the shop, which were loaned out at 3d per copy per week. Harry continued with the library for a number of years, but a gradual decline in its popularity along with the problems of lost, stolen or mutilated copies, caused him to discontinue. Love was obviously in the air in 1948, for both Harry and his partner decided to get married. Harry didn't have far to look, for he married Gladys Garton, a local girl who lived next door to the shop. The business was not big enough to support both couples so it was decided that Harry should buy Ted out and he and Gladys would run the business. Living next door to the shop, Gladys presumably knew what she was letting herself in for. Their wedding was at 1.30 p.m. and after a short reception, she was back in the shop at 4.30 p.m. serving papers in her wedding dress. There was no talk of a honeymoon. Were they to shut up shop, people would simply have taken their custom elsewhere. Harry and Gladys continued to work in the shop together until the mid-fifties when they bought a second business on Castle Boulevard. This was a sweetshop in the premises that presently house K.B. Insurance Brokers. Gladys ran the sweetshop for about three years but as they found it wasn't really a paying proposition, Gladys re-joined Harry in the Willoughby Street shop. By the mid-fifties it was clear that the days of the Willoughby Street area were strictly numbered. The City Council was eager to demolish all the old properties and completely redevelop the area. The local residents affected by the demolition would be offered council houses or flats elsewhere in the City but what about the shopkeepers? Harry and Gladys liked the Lenton area and wanted to stay here if possible. Some new shops were planned for the redevelopment, but not sufficient for everyone. One way to try and guarantee a place was to be still resident in the area when the government minister finally confirmed the demolition order. Partly to try and improve their chances Harry and Gladys bought out one of the other newsagents on the street (the one formerly owned by Tom Elliot} and ran both the shops until the demolition order came through. When the demolition experts moved in and all the properties' came down, Harry and Gladys continued in business, amongst all the rubble, from a caravan parked near the site of the present Thomas Helwys Baptist Church. The initial plans for the redeveloped area envisaged many more tower blocks than were eventually built. Willoughby Street was to be retained in its entirety, but widened, and new blocks of shops were to be positioned at intervals along its length. Test borings at the lower end of the street, however, revealed that the rock structure was inadequate to support such tall blocks of flats as were planned, so the plans had to be altered. Instead the low-rise development, which we now have, was designed and the proposal to retain Willoughby Street as a through route was abandoned. The shops were to be concentrated instead in the middle of the site arranged around a pedestrian precinct area. This effectively meant the shopkeepers would have to rely on the immediate neighbourhood for their custom and ruled out the possibility of picking up passing trade. Harry and Gladys had hoped to take a Shop at the lower end of Willoughby Street while Billy Hill could continue to serve the other end of the area. Instead the revised plans meant that both newsagents were forced to take the premises the Church Square shopping precinct almost within spitting distance of each other. Of the fifty-seven shopkeepers still trading on Willoughby Street when the demolition order came through, only three eventually chose to take a shop in Church Square. Eric Denham, who runs Eric's Store, was the third member of the trio. Although the Co-op took space for their supermarket, other businesses were generally unwilling to take the shop units and for many years several remained empty. It soon became apparent to the shopkeepers and local residents at least that the planners had designed a white elephant. Those shopkeepers who had made the move there initiated a rent strike, which embarrassed the City Council sufficiently, that they agreed to reduce the rents by half. In fact after fifteen years or so the rents have only just crept back to what the City Council initially tried to charge. In all those years in Lenton the Wells have continued to deliver the news, good or bad, to many homes in the Park, New Lenton, Old Lenton and as far out as Dunkirk. They have sold newspapers, magazines, sweets, cigarettes, stationery, greetings cards and small toys to all who have called at the shop. Over the years they have become a firm fixture on the Lenton scene. This year, however, they decided to call it a day and have sold the business. No more getting up early every day of the week and then working through the day until six o'clock with scarcely a break for rest. Now Harry and Gladys can begin to take it easy at their home in Wollaton Park. We are sure that everyone who knows them will wish them well for the future.